Diane’s in the news over the Twitter row, but she has been in the news for the past 25 years since she was elected in 1987. 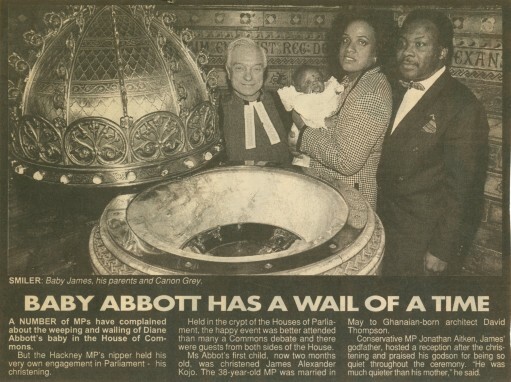 This cutting from 1991 records the christening of her son James Alexander Kojo. We are lighting a candle today for Gertrude Paul, who became the first black headteacher in Leeds, when she was appointed head of Elmhurst Middle School in Chapletown in 1976. Sadly Gertrude died aged 57 on Jan 7, 1992. For more about Gertrude’s achievement, see this link. Gertrude Paul Obituary, The Guardian Jan 24, 1992. Read this newspaper cutting from 1989. 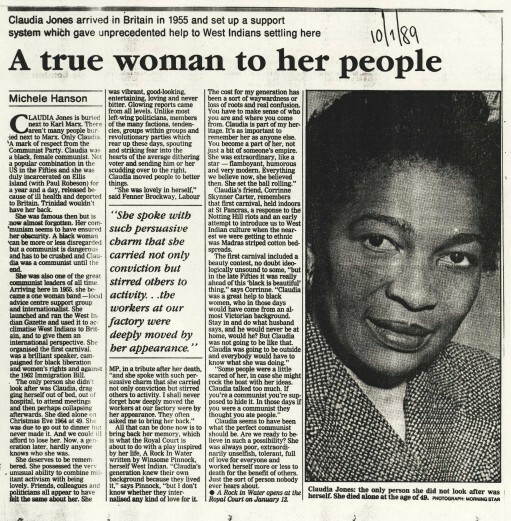 Now here’s someone who deserves to be remembered – Claudia Jones. She died on 24 December 1964, aged 49, so it’s appropriate to remember her at Christmas. She was such a very special lady. There aren’t many people who are buried next to Karl Marx, but Claudia Jones, out of a mark of respect from the Communist party, is buried next to him in Highgate cemetery in London..
Claudia was a Communist in America in the 1950s which was a dangerous position to be in at that time. So she was incarcerated on Ellis Island (with Paul Robeson and others), eventually released because of ill health and deported to Britain. Claudia was a trained journalist. She arrived in Britain in 1955 and became the first Black woman publisher in the UK. She launched and ran the West Indian Gazette which became an important newspaper for Caribbean people of the Windrush generation..
She campaigned for black liberation, women’s rights and against the 1962 Immigration Bill. Her legacy lives on with the Notting Hill Carnival which she was instrumental in establishing.